Thank you for all of your great emails, photos, and datasheets recently. We really appreciate all of your efforts, especially with the Cassin’s Auklet wreck. 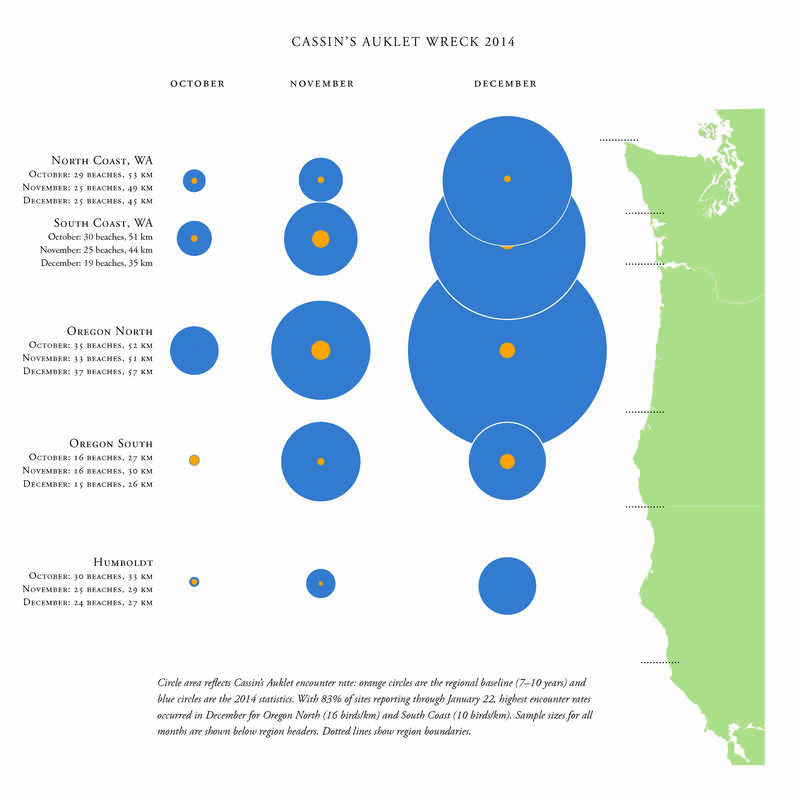 For the 11th week running, Cassin’s Auklets still WAY outnumber other species on COASST surveys – you can view the updated graphic with December’s numbers here. For Oregon COASSTers headed out this weekend, be aware that there is a potential “damaging wind storm” in the forecast for Sunday afternoon. Remember, your safety is always the #1 priority! Please avoid surveying if it is dangerous. If you do have nice weather on your next survey, however, we’d love your help with a special project. COASST is looking to create a collection of high quality beach photos featuring you! If you have a chance on your next survey to take a few photos of you or your survey partner/team with your beach in the background, we would love to gather these for future use on the new COASST website or in COASST presentations. Hope you all have a great weekend! We can’t wait to see your photos! Choose webbed (go to Q2), choose completely webbed (go to Q3), choose 4 toes, all webbed (Pouchbills: STOP). On PB1, select wing chord less than 35cm. 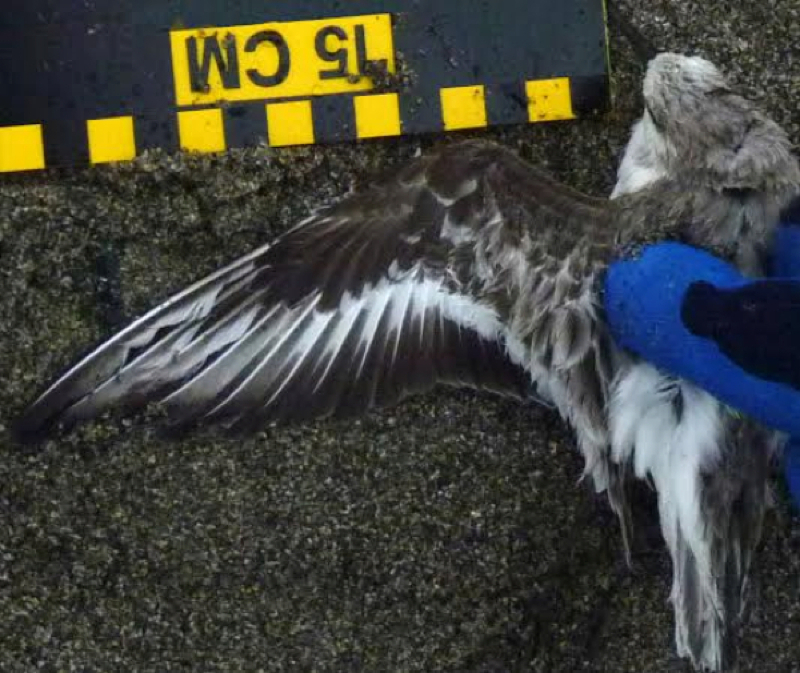 This bird doesn’t have a tan or orange chin, so it’s a Pelagic or Red-faced cormorant. Completely dark bill = Pelagic! Choose free (go to Q9), choose three toes, all front (Shorebirds: 3-toed: STOP). On SB1, we have either a Black Oystercatcher (SB10) or Sanderling (rare). Black Oystercatcher is WAY too large – plumage and bill are not a match. Stick with the Sanderling. At SB1, we’re left with Sandering (SB4), plovers and Black Oystercatcher (rare). Turns out, this IS a Sanderling – straight, black bill, dark wrist and wingtips. 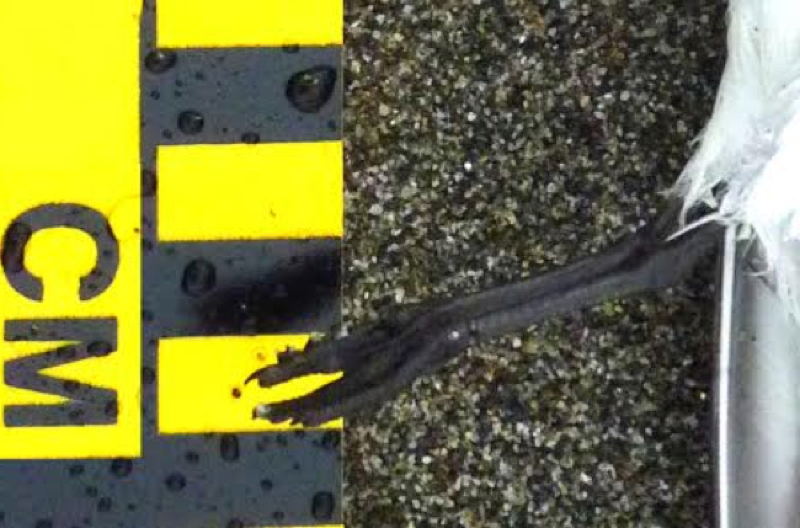 Debris or not debris? 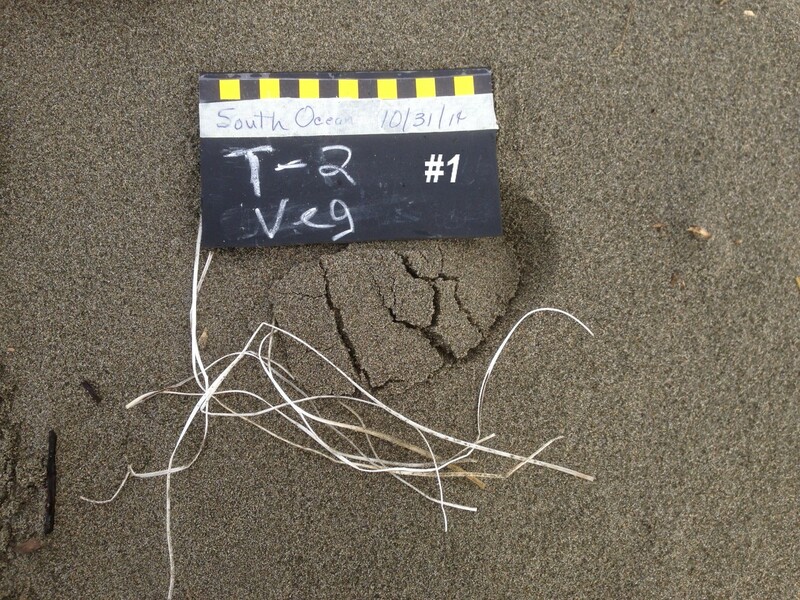 That is the question…in the case of the mysterious “plastic strings” that Virginia and Jean often find in their marine debris samples at South Ocean (WA). After seeing these survey photos, Hillary was curious about their origin and identity. Virginia and Jean kindly sent samples into the COASST office, where we were all perplexed. 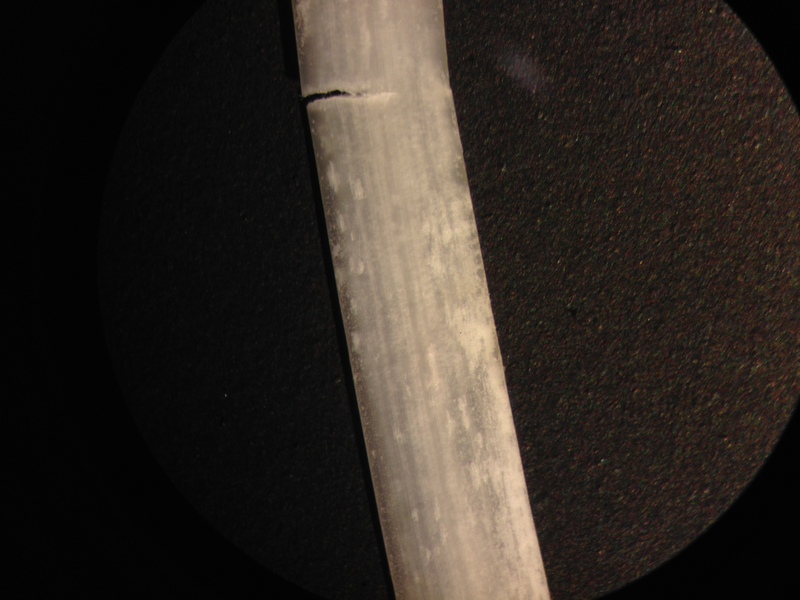 Review under a microscope revealed that the strings had cell structures, indicating that they were likely actually dried up plant or algae material. 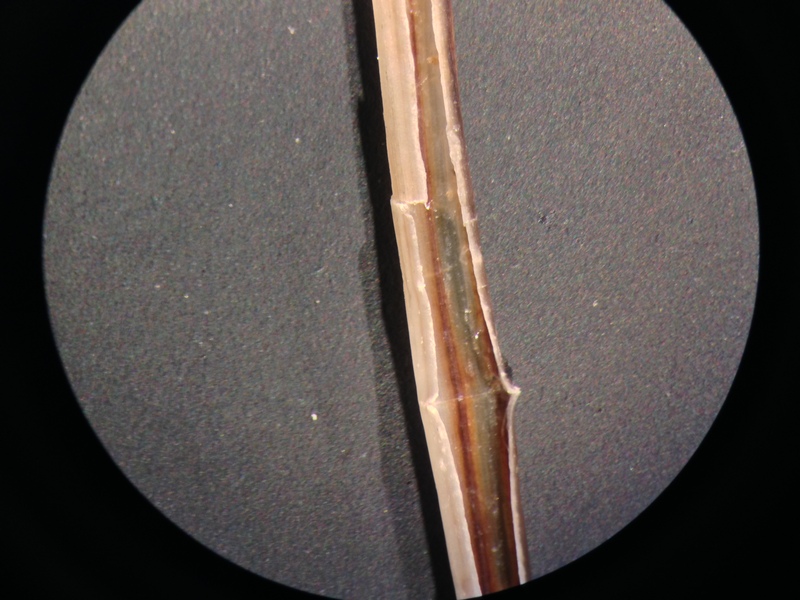 Suspecting that they might be a seagrass or something similar, intern Ruth took the magnified images below and sent them, along with a few samples to a team of seagrass experts at Friday Harbor Labs. Their conclusion? Sun bleached and dried Bur-reed, latin genus Sparganium, a plant closely related to cat-tails. Mystery solved! It’s not everyday that you see a fish washed in with another fish in its mouth! 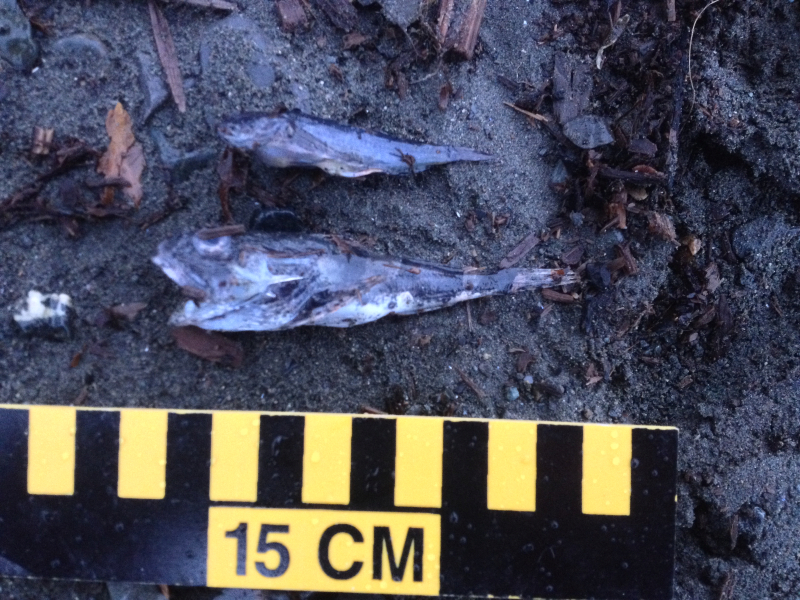 Take a look at the sculpins that Tasha and Chuck found at Spring Creek (AK). Sculpins are benthic, or bottom dwelling fish that can be found in a wide variety of habitats in both fresh and saltwater. While some sculpins are just centimeters in length like the ones pictured here, other species (of the 300+) can reach about 60 cm (or ~2 ft!). 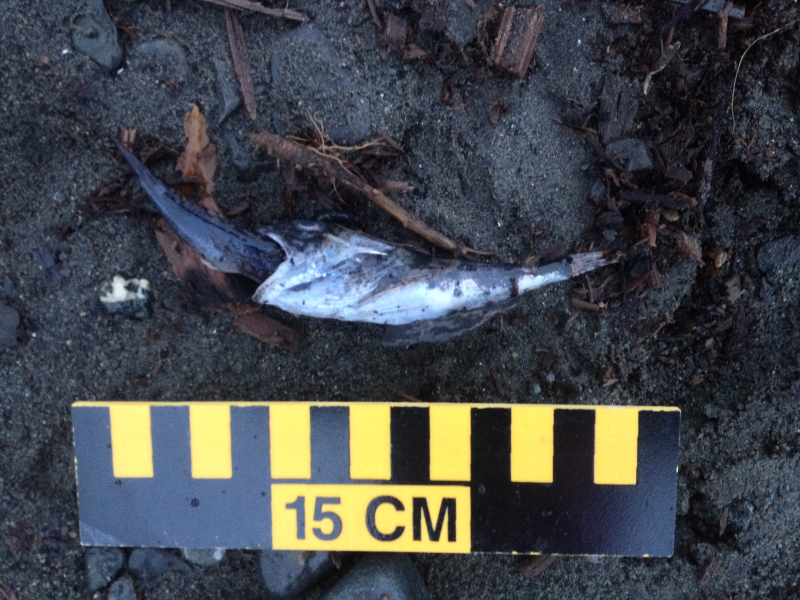 This entry was posted in Uncategorized and tagged Cassin's Auklet wreck, Fish, safety, volunteers on February 6, 2015 by coasst. 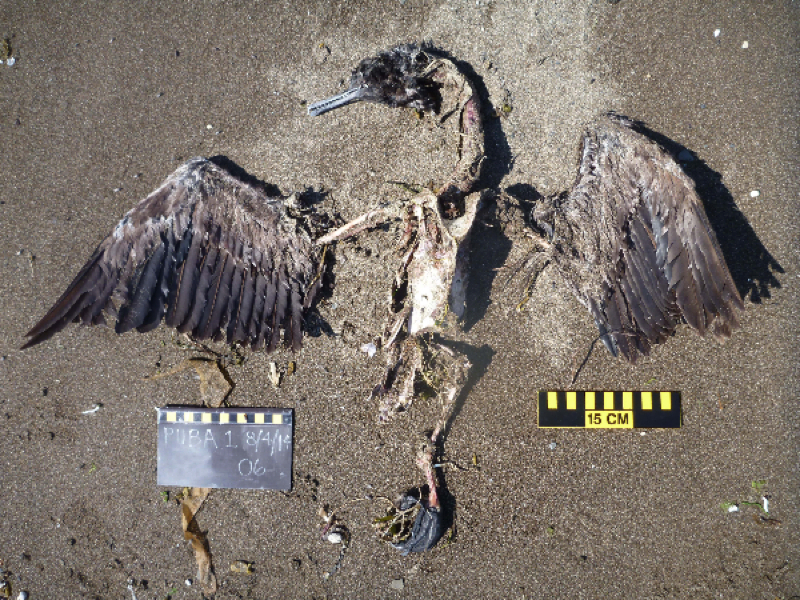 This entry was posted in Beached Birds, Uncategorized and tagged Alcids, Oregon, Washington, Wreck on February 5, 2015 by coasst.